The Bible is centered in Christ. The context and the rest of Scripture can guide us in our understanding of passages. We should not depart from the author’s intended meaning in Scripture. Often you’ll hear people say, “There are so many interpretations of the Bible, how do you know whose interpretation is right?” Or you’ll hear, “Oh that’s just your own interpretation,” if you have a different opinion than someone about what the Bible teaches. The fact is there is only one interpretation that is correct: Scripture’s interpretation, that is, the meaning intended by the author who first wrote that portion of Scripture. Therefore, determining what that author was saying with a particular passage is vital to understanding what God wants you and me to hear and to know. First and foremost, anyone who wants to understand the Bible needs to know that it all centers in Christ. Christians refer to this as Scripture being Christocentric. Jesus stated this (Luke 24:27, John 5:39). The apostles Peter (Acts 3:18, 3:24, 10:42-43; 1 Peter 1:10-12; 2 Peter 1:16, 3:2) and Paul (1 Corinthians 2:2; Ephesians 2:20; 2 Timothy 3:15) also stated this. All of Scripture is meant to point us to God’s love for us in Christ. This is why he has given us the Bible by speaking through his chosen human authors, which is called inspiration (see The Bible is the Word of God). The fact that Scripture is Christocentric and the fact that it is the inspired Word of God are the two presuppositions that are required for any true biblical interpretation. No one can be neutral in this matter (Matthew 12:30), and since these facts can only be recognized through faith that is given by the Holy Spirit (Romans 8:5-7, 1 Corinthians 2:14), faith is essential for having a proper understanding of what God is saying to us in the Bible. Secondly, it is important to point out that much of God’s Word is quite simple and easy to understand (Psalm 19:7; Psalm 119:130). Yes, there are some difficult passages, but almost all of the passages of Scripture give a clear meaning if you properly understand the context surrounding a book or passage of the Bible. 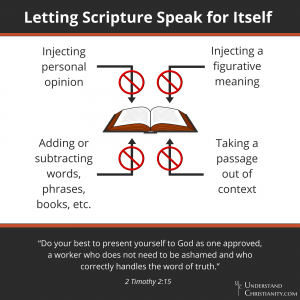 Where many people go wrong in interpreting the Bible is when they get away from the plain, simple meaning of a word or passage, such as injecting a figurative meaning to a portion of Scripture that is not meant to be taken figuratively. Injecting a figurative meaning into a passage is called allegorizing. For this reason, the overarching guideline in biblical interpretation is: SAYS = MEANS. What a passage or word says is what it means. Without this guideline all forms of communication are meaningless. Therefore, we should understand the writers of the Bible in the same way we understand any form of communication in our lives. Says = Means. Contrary to what many people believe, the Bible does not have to be “decoded.” It may seem obvious, but one simple fact is very important for biblical interpretation: Unless otherwise stated by the author or determined by the context, what an author says is what they mean. To whom is this person speaking or writing? Where is this person speaking or writing? When is this person speaking or writing? Why is this person speaking or writing what they are? Obviously, knowing who the author or speaker is at a particular place is important. Also knowing the location or time period from which they are writing or speaking can reveal a great deal about the historical context or even the words they used, particularly the nuances of their Greek or Hebrew language. Oftentimes the author of a particular book of the Bible will have a certain style or use certain words in a certain way. Sometimes knowing who the author’s audience was, their experiences, their relationship to the author, and even their attitudes toward the author or to God (see Law and Gospel) can have a great effect on understanding what the author was saying to them. The social, cultural, economic, educational, religious, political, geographical, personal, and even agricultural situations of these people can all have an influence on an author’s message as well. All of these things will help the Bible reader determine why an author or speaker was saying what they were saying in a particular portion of Scripture. See the Bible section of this website if you need help determining the answers to these questions. Much of this information can actually be determined quite easily by looking at the immediate and wider contexts of a particular passage. The immediate context is the portion of Scripture either directly before or immediately following a passage. 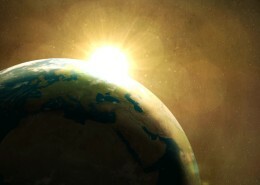 The wider context of a passage is looking at that passage’s place in the particular chapter, the particular book, the group of books, and even the point in time that passage was written in relation to the rest of salvation history (see the Timeline of Salvation History, the Chronology of Old Testament Books, and the Chronology of New Testament Books). Knowing where a passage is in relation to its immediate and wider contexts can go a long way in understanding what point the author or speaker is making. When trying to understand the point an author or speaker is making it is important not to go beyond the simple meaning of the words. This means no Christian should ever add spiritual or figurative meanings to passages where the author has not made it clear the passages are to be taken spiritually or figuratively. 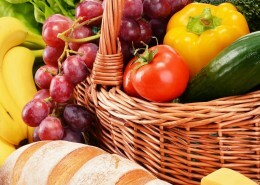 We do not have to add layer upon layer of spiritual meaning to passages. 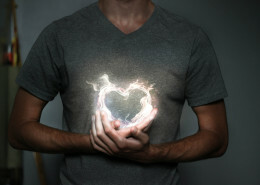 There is always something very clear that God is trying to communicate to us with a passage. Sometimes it’s as simple as a name of a person or a location of a city that helps the reader better understand the context. This is especially important when looking at the words of Christ himself. Jesus often spoke in a simple and straightforward way. Even when he spoke in parables he was making one point throughout each parable by using something the people would know from their everyday lives to help them understand that point even more (for example, see Matthew 13:31-32, 44-46). And whenever the point was difficult to understand, the author would provide the explanation by Jesus himself so the reader could understand the point of the parable (for example, Matthew 13:3-9, 18-23). Not going beyond the simple meaning of words is extremely important for biblical interpretation. 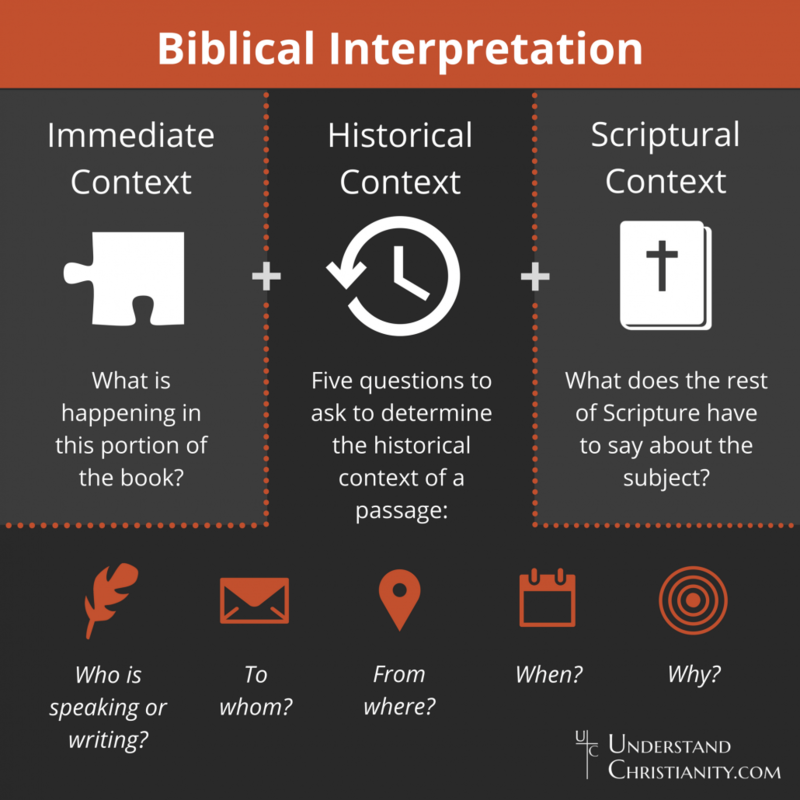 Keeping in mind four aspects of biblical interpretation will go a long way in helping the reader properly interpret Scripture. First, the Bible is an ancient text. God has miraculously preserved this ancient text through the meticulous hand-copying from believers throughout the last 3,500 years. There are variants in the text that need to be evaluated, but thanks to the thousands of copies and careful work of these people in the past, more than 99% of Scripture we can confidently say is the same as the original copy, with the remaining less than 1% not affecting a single teaching. Second, the Bible is a historical document that has been written in various historical, geographical, and cultural contexts. Third, the Bible is a literary document that was written in mostly two original languages, Hebrew (Old Testament) and Greek (New Testament). Any interpretation of the Bible needs to be grounded in the proper use of these original languages. These first three aspects are common to the interpretation and evaluation of all documents throughout history. However, the fourth aspect is the one that sets the Bible apart from all of the rest: the Bible is a sacred text. This means that to understand it properly, a person must read it with the two spiritual presuppositions mentioned earlier: that the Bible is Christocentric and is the inspired Word of God. Failing to do so will only lead the reader away from the simple guideline SAYS=MEANS and cause the reader to fail to hear God’s simple message. So why are there so many interpretations of Bible passages? 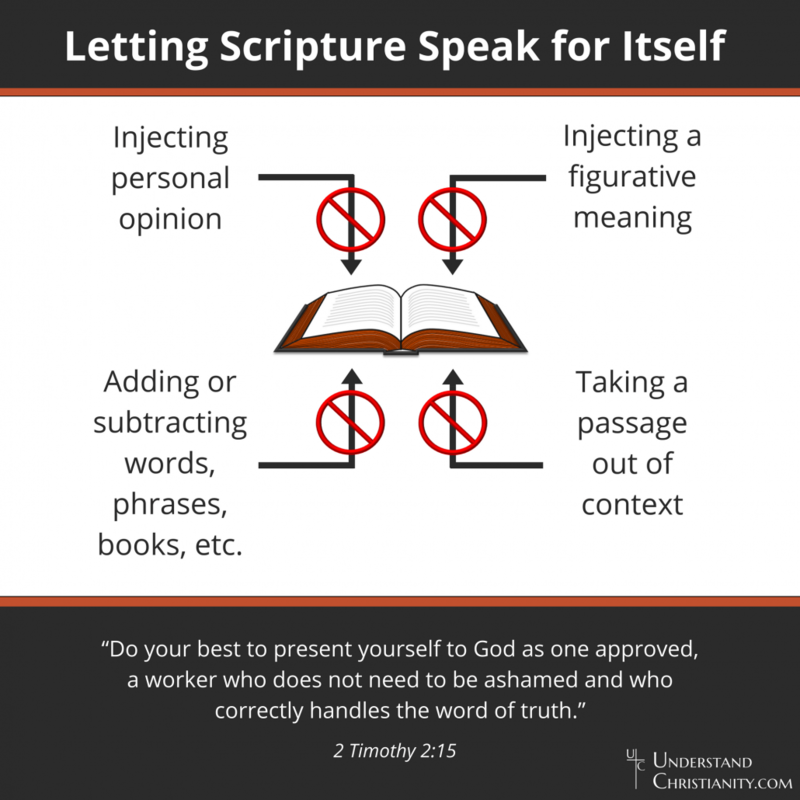 Because many people do not follow these proper practices when they attempt to interpret Scripture. Sadly, quite often people allow their own personal ideas and biases to affect their view of a passage. 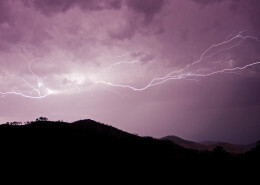 Many times this is seen when people simply deny the supernatural. 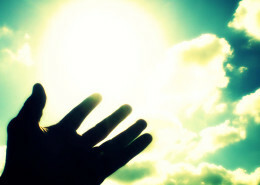 They dismiss miracles as myths or fantasies and fail to believe in God’s power to do things we cannot explain. Many others misuse passages of Scripture by ignoring or failing to see it in its context, getting away from the meaning the author intended for it and shaping it to fit their own thoughts and motives. And still others fail to recognize what genre of literature a portion of Scripture falls under. There are books that are clearly narrative, poetry, prophecies, letters, or what Christians call apocalyptic literature, literature characterized by fantastic imagery, such as many portions of Ezekiel and the entire book of Revelation. Such symbolic and figurative language will be obvious from the context or will be stated as such by the author (for example, Galatians 4:24), and yet many people apply the wrong genre to these portions of Scripture and take them as literal. Sadly, there are many ways people—including Christians—poorly interpret the Bible. In order to avoid these pitfalls, the Bible reader must always leave the interpretation of Scripture to Scripture itself. The Bible is one perfect unit given by God, and therefore we should not let our own personal ideas, emotions, and feelings guide our interpretation. We must also properly use our human reason. Human reason is a beautiful gift from God, but it must always be a servant of Scripture and not the master (2 Corinthians 10:5). Special care must be taken in the interpretation of figurative, difficult, or obscure passages. Consulting all of Scripture and allowing all of it together to guide us will help us see what God is saying with a particular passage. The Lists of References provided for each Christian teaching on this website is meant to help you with this task. For biblical interpretation, it is very important to let Scripture interpret Scripture. While there are many interpretations of Bible passages in the world, you can see that this is caused not by the existence of many interpretations but by the existence of many methods of interpretation. By using the proper method of interpretation, that is, biblical interpretation, the Bible reader will be able to understand the simple message God has given us in his Word. 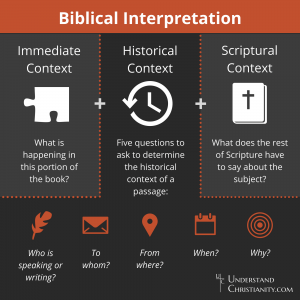 Understanding the four aspects of biblical interpretation, the context of the passages, and letting Scripture interpret Scripture will help you truly appreciate the Savior that God has sent and proclaimed throughout the world.